That’s the million dollar question! 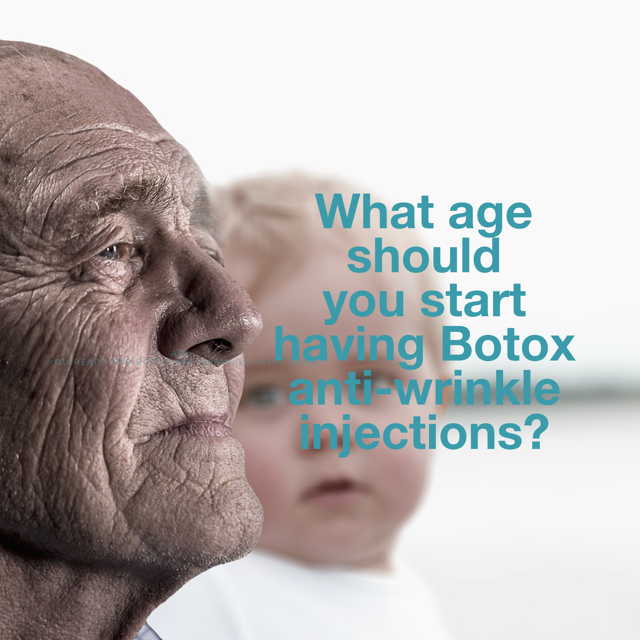 At what age should YOU start having Botox? Although Botox has become normalized for some people, it is still considered an extreme measure for others. I am 100% sure that we all know someone who has Botox injections, whether they have told you or not. However, what’s most important is that you decide when you are ready, and not to book a treatment because your friends are doing it. Lifestyle. You can read my six skin sins blog here. How much sun exposure you’ve had, read about photo ageing here. Each of these factors tells us how your skin is coping and whether or not it could do with a helping hand or not. These factors combine to determine the age you could start benefitting from Botox. More and more often I am seeing girls in their early 20’s who want Botox injections. This makes me feel uneasy for the simple reason that young girls shouldn’t be concerned with wrinkles – they have enough going on in their lives as it is. As a Mum, observing the pressure young girls are under often makes me very sad. Now, although I’m part of the cosmetic industry, a personal goal of mine is to leave it better than I found it. I’m a big believer in the use of cosmetic procedures like Botox as a means of boosting confidence – but not in the pursuit of ‘looking perfect’. For instance, legally, you can start having Botox injections at age 18. However, in my practice, I will only see people who are 25 years and over. Even then, I often turn them away and give them proper skincare advice and tips to follow instead, if I believe they’re not suitable for Botox treatment. In my opinion, only a few people in their 20’s will be suitable for treatment. A client of mine, who’s a singer, is very expressive and frowns a lot when she performs. By softening her frown lines, her make up sits better and lasts longer on her skin. This allows her to feel less self-conscious allowing her to focus on her singing. This is an exception in my practice. This is definitely a thing, and I myself first had Botox when I was 29 for this very reason. By having a little Botox before your lines get deeper, it will ultimately prevent you from needing more invasive procedures later down the line. It’ll also prevent you from needing as many Botox injections later on too! According to the American (why do they always have more stats than us?) Society of Plastic Surgeons, women in their 20’s make up a massive 30% of Botox users. This was surprising to me, as the average age of my clients is 38, which I’m pretty sure, and I hope, is more representative of us in the UK. We usually start to notice some lines as we hit our 30’s. Plus, our skin won’t bounce back like it used to, after a late night for example. It’s often the frown area that’s the first to become obvious, followed by the skin around our eyes, although this varies from person to person. In a nutshell, it’s all about prevention here. I regularly see people just before their 40th and 50th birthdays, which is absolutely great. However, the effects of Botox treatment don’t last quite as long at this point and they usually need a package of treatments to target a variety of skin needs alongside their lines and wrinkles. For example, they’ll now have areas of pigmentation, volume loss and loose skin which they’ll want to have treated as well. Some of this could be avoided with some preventative Botox a little earlier. The lines you have will start to become deeper and you’ll start to see your gorgeous Mum in the mirror. It’s time to raise your game with the skincare! You need stronger products (link?) to make a difference. Now, it’s all about looking as healthy and vigorous as possible. Menopause dries out our skin, so, naturally, more lines will appear – time to increase the moisture levels! Natural looking results with Botox are vital here. There’s no point in having a smooth forehead if the rest of your face is wrinkled, it won’t make you look well, and it certainly won’t make you look younger. Less – is – more. Whatever your age. Skin Nurse Tip – Look at your parents and how they’ve aged, where are their deeper set lines and wrinkles? If you see the beginnings of these same lines on your own face, this is a sign to start to prevent these from worsening. There are many great skincare options that will help with this too, ie Retinol, when used under guidance is a good all-rounder for anti-ageing and getting your glow on! How YOU feel about your lines and wrinkles. It doesn’t matter what anyone else is or isn’t doing. The advice you get after a skin and facial assessment with an honest professional, who doesn’t just want your money. If you want to come and speak to someone who’s unbiased and honest, book your consultation with me here.